A make ahead one bite appetizer that will surely satisfy the guests need for a delicious bite and host(ess)'s need for no fuss cooking. Stir the curry powder into the sour cream and stir. This can be made a day or two ahead and kept covered in the refrigerator. I think the flavor improves with time. Whisk together the flours, sugar, baking soda and salt. Add the turmeric now if you opt to use it. I think the color is much more appealing with turmeric. In another bowl whisk the aquafaba until it begins to froth. Just a little foam on the top is all we are looking for, about three minutes by hand. Now stir in the melted butter and the soy milk. Pour the liquid ingredients into the bowl with the dry and stir to combine. If too thick then a bit more soy milk. Heat a heavy bottomed pan over medium and add a tsp of oil, swirl to coat. When the pan is nice and hot then spoon in half tablespoon portions of the batter until you have about 6 blini going in the pan. Cook about 1 minute until you see little bubbles on the surface and then flip. I love my tiny offset spatula for this job. Cook another 45 second and remove from pan. Continue in the manner until you have gone through all of the batter. You can freeze them at this point and defrost and warm to room temperature as needed. 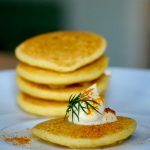 Or use to right away: arrange the blini on a platter and top each with a tiny dollop of curried sour cream and a tiny frond of dill.